I was at Helix early in the morning a few weeks ago and I noticed something really interesting. Walking down a corridor, I saw colored light shining on the wall, just like the light you might see through a stained glass window. Invisible Stained Glass… Visible colors? But as I walked further, the light reflection changed to white! Invisible Stained Glass… invisible colors. 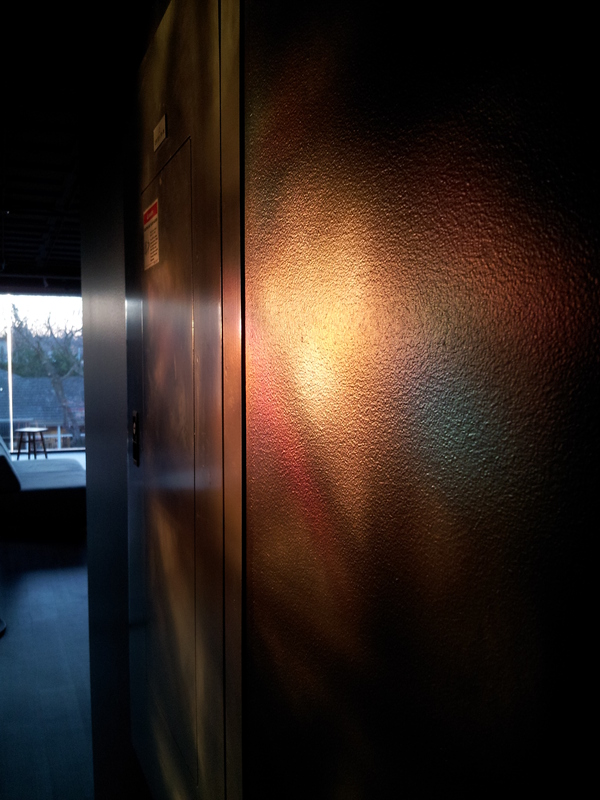 I’d re-discovered another phenomenon of our awesome exhibit, Invisible Stained Glass. 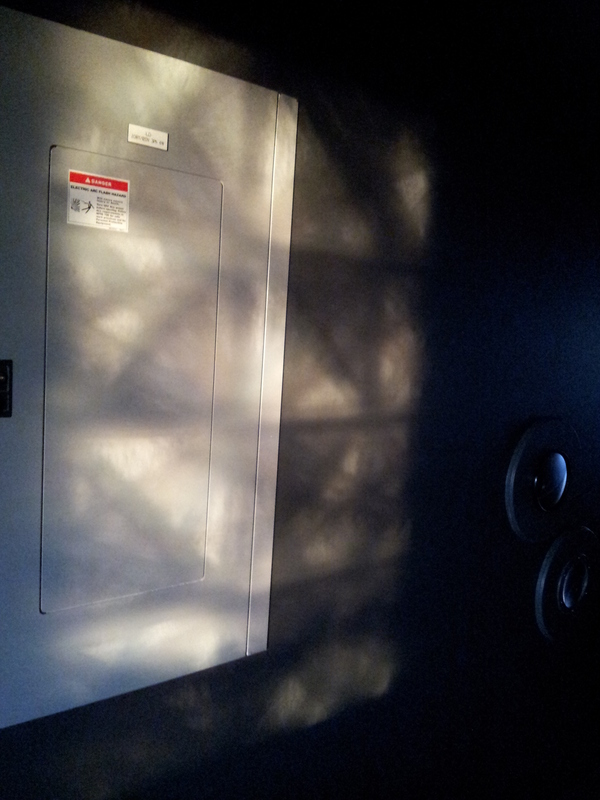 This exhibit starts with a window covered with a panel of plexiglass with polarizing film and packing tape on it. Not far away there are some wheels of plastic with another layer of polarizing film. The polarizing film limits the light that passes through to waves coming from a particular angle. This is the same principle used for polarized sunglasses and polarized windshields in cars that help reduce glare, or light reflecting from surrounding surfaces. When you look directly at the window, it looks pretty clear. But look through the wheels of polarizing plastic, and you can see colors and dark triangles that change as you spin the wheel. The visual display of colors and dark shapes are created by different speeds of light passing through the layers of materials. Light that is polarized parallel to the length of the tape travels through it more slowly, and the different layers and angles of tape cause that slowed-down light to show up to our eyes as different colors when viewed through a second layer of polarizing film. I’d also noticed that I could see the colors really nicely in reflections—like in the glass of Aeolian Landscape, a coffee-table-like exhibit nearby, or even reflected in the screen of my cell phone. I wondered if maybe these surfaces were polarized too. But I was not expecting to see the colors wind up in the shadow on the wall. In order to better understand the phenomenon, I wrote to the Exploratorium’s senior scientist, physicist Paul Doherty. Paul told me that any non-metal surface at a specific angle from the polarized window would act as a second polarized surface. He said that the specific angle is called Brewster’s Angle, and the precise angle varies with the medium through which the light is passing. When I stood at an angle to the wall, the light bouncing back that showed colors must have been bouncing back to me at Brewster’s Angle. But when I moved out of that spot, my eye could no longer see the colors, because I was no longer standing in the path of the re-polarized light. At least, this is my current best understanding. If you can explain it another way, please let me know! Invisible Stained Glass is one of my top ten most favorite exhibits at Helix right now. You can make a mini version of this exhibit to explore at home—or just decorate your windows. You’ll need some clear packing tape, a piece of clear plastic to decorate, and two sheets of polarizing film. (You’re looking for linear polarizing film, which generally runs about $5 for a piece 4 inches square—you’ll want to avoid sticking the tape directly to the film, so you can use it again. You can also use polarized sunglasses to replace one of the polarized film squares, if you have a pair already.) Try different angles and layers of tape and see how it changes the colors you see! Can you find Brewster’s Angle with a shiny, non-metal surface?